Last month, Intel and Micron unveiled 3D XPoint technology – pronounced 3D Crosspoint – promising over 1,000 times the performance and durability of NAND flash, and 10 times the density of DRAM for non-volatile memory. Intel has now showcased some of the first products to use that technology with an Optane SSD. 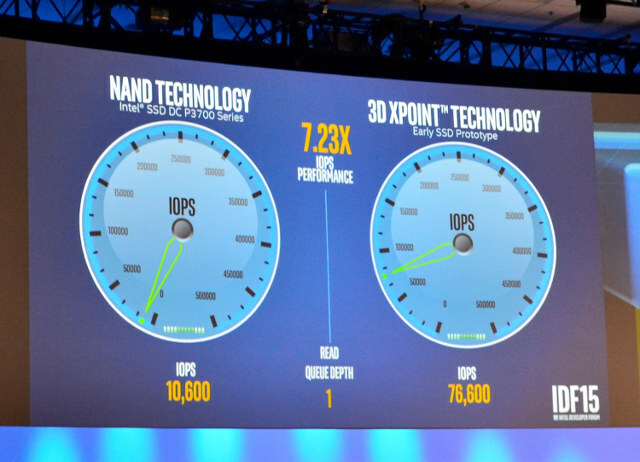 At IDF 2015, Intel compared the performance of their high-end P3700 SSD delivering 10,600 IOPS against an early 3D Xpoint “Optane” SSD prototype that could deliver 76,600 IOPS or 7.23 times more I/O per seconds, while according to Anandtech some other tests still ran 5 times faster on 3D Xpoint compared the NAND based SSD. Intel plans to release 3D XPoint SSD in 2016, as well as 3D Xpoint DIMM modules for the datacenters. These are exciting developments, but it will probably take a few more years before it comes affordable for consumer devices, as a 400GB P3700 SSD already costs close to $900.